After blowing up my second linear rail tonight (I didn't follow @csorrows' advice so far...) I want to share some insights and get a recommendation for the perfect lubricant. Plus, I would really ask the Folger team to include this knowledge in their owner's manual: Cleaning process during assembly, cleaning agent, lubricant, lubrication intervals. Some lines of text would have saved me a nice amount of time, hassle and money. The other side is just as bad. Everything from thin brownish oil to thick, black, gooey stuff. For the next print hours, the carriages will run on sewing machine oil to clean out all rust and dirt. Afterwards, I would like to switch to the correct lubricant. In this thread, @csorrows states he uses/used PFTE-based grease. I did some reseach and the matter seems a little complicated. Lubricant manufacturers provide different recommendations depending on the operating environment and the type and speed of carriage movements. This makes sense to me - for example, during micro steps, the carriage only moves a millimeter or so back and forth. I can imagine that this creates very different lubrication issues than a wheel bearing that always spins in one direction. In my case, I will also have to take the temperature into account - I plan on converting both my FT-5s for enclosed ABS printing, so the rails will work in 70°C environment temperature. Thus I would be grateful for suggestions on particular lubrication products - so far I could find that stuff - and also for best practices on how to get the grease into the carriage, lubrication intervals, cleaning etc. finish line makes great grease. its better to not use too much. i have been thinking about how the best way to clean the shuttles. and i believe if one were comfortable enough to pull the shuttles off and remove the bearings carefully not to lose any of the bearings. a soak in #2 fuel oil or kerosene. then if you can work a pipe cleaner into the channel. you can also use atf(automatic trans fluid) and kerosene 1:1 mix. the atf will act as a cleaning agent and the kerosene will act as a break down agent. if you have a sonic cleaner it would help. and now that that i think about it i might have to pull mine out and clean them. i can honestly say superlube works great as well. After all that work would it not make sense to have a spare set of linear bearings around so you can swap and then clean the others. I would just as soon buy new myself. we are talking about the bearings and not the rails right? How doe's one 'blow a rail'? I prepared mine with TriFlow. NO GREASE : fine oil ! My blocks run smooth from the beginning. Yes : I also got this rusty oil coming from them initially. For what it's worth none of the lubricants THK or Hiwin recommend are PTFE based. THK recommends synthetic oil with urea thickener for "microstrokes" but this is probably obsessing about things that may not matter to us. Probably any decent lubricant that is not contaminated is light years beyond what the rails came with. Yes, ball screws are similar in many ways with both having channels with recirculating ball bearings. Probably best to avoid oil that is so thin it just creeps/runs out. On a slightly related note, since I am one of the few people with extra carriages and shipping inserts. I made a model of the shipping insert for the carriage. The carriages that came with the printer (mine anyways) have wires that should retain the bearings in most situations if you are careful. we are talking about the bearings and not the rails right? How doe's one 'blow a rail'? 'blow up / destroy' is what I wanted to say - sorry not a native speaker And yes, it's probably the carriage that is shot and not so much the rail. @Walter and @CriticalMass thanks for the suggestions! I'm not an engineer, but what I found out so far via web research: Both oils and greases are offered for recirculating ball carriages. For micro-movement applications, dedicated grease types exist. This makes sense to me, as this certainly is a different scenario than a wheel bearing that constantly spins in one direction. For industrial applications, the main advantage of oil seems to be the purging effect, while the main advantage of grease seems to be longer maintenance intervals / no need for a cental lubrication system. In my opinion, the purging effect is valuable, and the effort of cleaning and lubricating the rails from time to time is negligible. I'm not inclined to using thin oil or sewing machine oil permanently. I don't know about guns, but in sewing machines, many bearings are realized as slide bearings. So there are large gear and bearing surface areas that carry little loads, but should move with ease. IMO, this asks for a very thin and easily flowing oil. Ball bearings like in the linear carriages have small surface areas, so this type of oil might be too thin. Tri-Flow is described as 'penetrating' oil and can also be used as a cleaner, so it's probably a rather thin oil as well?! However the temperature range is impressive and might be a good fit for my application. @Walter, roughly how many print hours have you been using this oil? Thanks everyone, also for the shipping insert Thing @CriticalMass! Yes I am also using Super Lube. Mine is the oil type but does not seem to "run out" and stays on the rails and inside the bearing ways. I do not know if it is the best to use, but does keep mine running plenty smooth. To request info be added to the manual, you would have to contact FolgerTech as we are only a community based support group. Some of us do have contact with John Folger, but requests should be sent directly to them. Also, I did not suggest using a PTFE based lubricant, I simply stated that is what I used. Just wanted to make that distinction. OK I agree with the distinction, sorry for the lack of precision, I corrected my post. Meanwhile on Facebook, John Folger states that he uses the spray version of Super Lube. Well great, the knowledge is there... so why is it not part of the manual? About 80$ in damaged parts and lost filament after approximately 180 print hours, not counting the repair work and hassle, that could have been well avoided. As I see it, this community based support group adds value and development work to the company's products. Sending request to the manufacturer to add things I figured out myself and with the help of others for the benefit of future customers seems a little freaky to me. Sorry. This is why I recommended you contact FolgerTech. You kinda said you wanted to. Unfortunately, not really available in Germany. Plus, there seems to be an awful lot of WD40-type cleaner / rust-protector 'lubricants' (not 'oils') with PFTE particles out there, accompanied by dry PFTE lubricants and all sorts of bike chain oils that tend to be very sticky because they need to be waterproof. I use the 51004 in case anyone is interested. I did a little research on what type of oil/grease that I should use but not a lot as my background has involved different types of machinery and spinning parts. I decided on a silicone based oil using hydraulic oil for remote controlled vehicles (50W) as it has good adherence and doesn't run or fly off and you use it sparingly. To clean rails (as in the past) I use a little acetone (don't breathe to deep!) and an airbrush Q-Tip as the cotton is very tightly wound and will not separate as a normal Q-Tip does. The airbrush Q-Tip is very small and works well getting into the small tracks of the rail. Sounds like you could go swimming. Thanks for the hint with the Airbrush Q-Tips! For me, a single layer of paper towel over the fingernail works well. 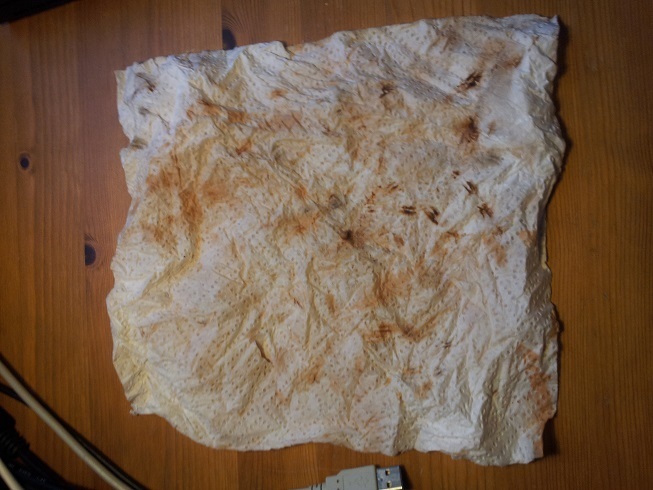 It's incredible how much brown gooey stuff keeps coming out of the rails even at the third purging (heaps of sewing machine oil and letting the printer run for some hours). So IMO, for anyone with access to a sonic tank this cleaning would certainly make sense. Looking for advice on how best to deal with less than smooth linear rails. It is one or maybe both of the y-axis rails. After reading about some of the issues people have had, I thought I was going to be able to eliminate such issue by cleaning and lubrication the rails/carriages before even starting my build. I flooded the underside of the carriages with WD-40 and vigorously moved the carriages along the rails. I did this a number of times, until there was no residue coming onto a clean rag. I then lubricated with 3-in-1 oil. However, regarding smooth operation, I can't say I was ever 100% happy with one or both the y-axis rails. One or both appear to get stuck barings in the carriage. That is just what it feels like, I can't say for sure. They will move smoothly and then in one spot or another have significant resistance. I can also feel a sort of vibration or resonance when moving the gantry somewhat quickly. I find that if I put more downward force the resistance is lessened. I should say that I had these concerns before putting the gantry in place, but it is worse now. I'm thinking of taking them completely apart and cleaning, but am not 100% sure I want to deal with putting all the bearings back in place. Is it difficult? I plan on picking up some super lube in one of the spray or micro oilers, and first give that a try. Thoughts?